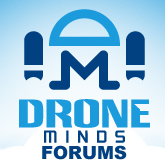 Discussion in 'FPV Setups and Racing Drones' started by Jonathan, Nov 25, 2017. Top consumer drone company, DJI, has revamped their FPV (first person view) goggles this week, specifically tailoring them to the fast rising sport of FPV drone racing. The DJI Goggles RE, or DJI Goggles Racing Edition has an updated exterior with a matte black metallic finish to the visor body, and red leather padding around the inside of the headband, giving the overall feal of a Ferrari F1 racer. The goggles are also able to receive signals from regular drone racing analog VTXs!